At the Community Roundtable weekly chat on Wednesday, Francois Gossieaux of Beeline Labs led a discussion about community participation and shared the results of the Tribalization of Business community survey that he is working on in conjunction with Deloitte and The Society for New Media Research. The other interesting part of the discussion were the four insights that he shared with us about the traits of companies who are successful with their community efforts. The “tribes” comment resonated a lot with me. With tribes, group behavior is key – where in segments, personal characteristics are in charge. Essentially, it’s about finding groups of people who have something in common based on their behavior and not their market characteristics. You can also find out more information on the Tribalization of Business website. As part of a recent interview process, I was asked to perform a series of projects as ‘homework’ to demonstrate my thinking, writing and presentation skills. One of the projects was to create an estimate on the size of the social media software market. While I didn’t get the job, the good news is that I am not going to let my research efforts gather dust or sit on my laptop in perpetuity. White Label – the usual suspects including Awareness, HiveLive, Jive, KickApps, Leverage, Lithium, Mzinga, Pluck, Telligent, etc. Budget – vBulletin, Boonex, Ning, etc. Open Source – Drupal, Joomla, WordPress, etc. Conclusion – the total US social media software space is estimated at $600 million in revenue and 1.26 million potential customers. The Global market likely adds 50% to totals – $900 million in revenue and 2.0 million prospects, and I estimated that 15-20% of overall market is currently penetrated. I was not able to locate any published market sizing numbers for the Social Media software market – so I was unable to determine if I was in the ball park according to other numbers. Plus, my analysis takes a quick-n-dirty approach and I would definitely validate it further if I were ‘getting paid’ for the assignment. So, does anyone agree or disagree with the numbers or my approach? I welcome any and all comments, suggestions and rebuttals. BTW, if you are really interested in the detailed approach, a picture of my detailed spreadsheet is copied below. If you send me an email, I would be more than happy to send you a copy of the Excel file. I’m back from Forum One’s Online Community Unconference held at the Computer History Museum in Mountain View, California and I have a great deal of information to digest. I’ll be summarizing my thoughts in a series of blog posts later this month, but I wanted to start by jotting some notes down now. The Unconference also starts off with all 250 participants giving a brief introduction of who they are and the question they are seeking to get answered. While this takes almost an hour to complete, it is interesting to hear what people are doing and it is a great icebreaker to get a brief introduction so you can follow up with people later in the conference. 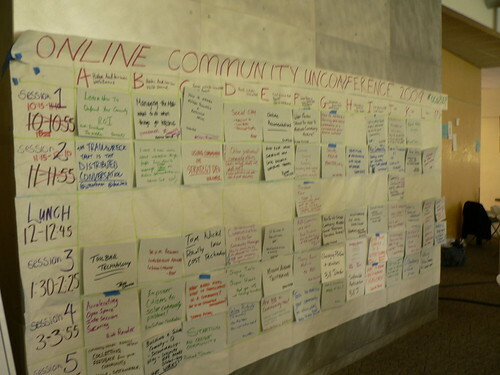 The day’s agenda is also set up in a free form, crowdsourced manner with individuals suggesting topics that they would like to lead and when they would like to lead them. There are 5 timeslots during the day with up to 13 possible topics for each session. And since you cannot attend all 65 sessions, note takers are assigned for each session and the notes are compiled in the conference wiki. Bill Johnston and the rest of the Forum One team did a great job moderating the proceedings. I almost forgot to mention the ‘retro’ Twinkies, Ho Hos and Ding Dongs provided for the afternoon snack. Fresh cherries, apricots and apples were also part of the afternoon fare for any ‘health-conscious’ or virtuous conference participants. Many participants were twittering during the day (including me) and you should definitely check out the OCU2009 Twitter feed as there are lots of great nuggets and people to discover. I had the feed open on my laptop during the day and started following at least 15 new people on Twitter. The Twitter and Flickr hashtag for the conference is OCU2009 in case you want to follow it on your own. It was also decided at the close of the conference that the follow-on Twitter hashtag will be #OCTRIBE. The day ended with the traditional gifting of bottles of Sonoma wine to attendees who made a difference in either a big or little way during the day as determined by the audience. Stay tuned for my upcoming OCU2009 posts. I received a copy of the new ReadWriteWeb’s Guide to Online Community Management last month and it is definitely worth looking at if you want to raise the level of your community management and social media game. It is a collection of tips, talking points, data points and other collective knowledge from many different experts. RRW editors looked through hundreds of articles and resources, and choose the best ones to be included in the report. Businesses seeking to engage with online communities on their own websites or all around the social web will find the guide invaluable in getting up to speed on the state of the art and making sure their employees have the foundation they need to be effective. Then, the guide covers the need for community managers, ROI, job descriptions, marketing/engagement balance and dealing with challenging community members. The guide ends with several interviews, a list of the 3 best podcasts on community management and additional resources. The best part is the online companion (Community Management Aggregator) to the official guide. This password protected website provides a dynamic and updated selection of articles and blog posts related to social media and community, links to featured blogs and Twitter addresses for leading experts. The Guide and access to the Community Management Aggregator costs $299 and it is a bargain for the information and access provided. Did I forget to mention that my blog post on “The Importance of Active Community Management” is listed on page 30 of the report and I’m included in the list of experts on the Aggregator site?